Intel® Scalable System Framework Reference Designs provide starting points to help high performance computing (HPC) system vendors and purchasers specify, design, and build HPC systems that are used to gain insights through compute and data-centric workloads as well as advanced machine learning techniques. 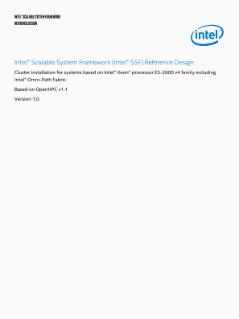 Intel® Scalable System Framework Reference Designs for high performance computing ...systems include specific Intel® Scalable System Framework (Intel® SSF) hardware and software elements and technologies and contain installation and configuration instructions. This reference design includes Intel® Xeon® processor E5-2600 v4 product family and Intel® Omni-Path Fabric, and uses the OpenHPC software stack.